In 2007, researchers from the University of Alberta were collecting plant samples from the receding edges of the Teardrop Glacier in the Canadian Arctic. These included bryophytes (non-vascular land plants) that had been frozen for 400 to 600 years. Project leader Catherine La Farge describes, "As we walked up to the edge of the glacier, we could see patches of mosses that seemed to be coming out from underneath the ice. They were blackened, but there were also tints of green in there as well. As I looked more closely I thought, 'Oh my gosh, what's this? Either this has somehow managed to retain a vestige of its original color or it's just started to grow again after centuries under the ice.' The thought of that just blew my mind." The scientists were able to regrow 4 different taxa and thereby confirm that bryophytes are among the most resilient flora yet discovered. 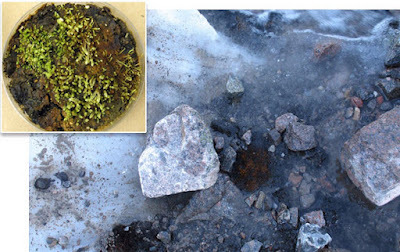 Since the bryophytes had frozen during the Little Ice Age - a period of cooling lasting a few centuries and ending in the 19th c., the researchers theorize that they played a strong role in recolonizing areas of the Canadian and Alaskan Arctic as they were revealed by glacier melt. The plants are still flourishing in a lab in Edmonton, and their wild cousins are sprouting along the foot of the Teardrop Glacier.